Search for mechanical problems before you buy a used car. That car for sale in your neighborhood may cost less than it would at a dealership but you should do some research before you pay. Because you are buying it from a private seller, there is no warranty. This means that the owner is selling the car “As is,” and there is little you can do if it starts acting funny later. Learn as much as you can about a used car so you can buy it with confidence. Your first contact with the seller, via phone or email, is your opportunity to learn information that would determine whether to buy the car or keep looking. For instance, ask the seller about mileage, the condition of the car and the owner's reasons for selling it. If the seller is willing to give you the VIN -- vehicle identification number -- you can check the car’s history at the Department of Motor Vehicles or through a website like Carfax.com. You could get a DMV report from the Department of Justice’s National Motor Vehicle Title Information System for $4 or pay $39.99 to $54.99 for a Carfax report. 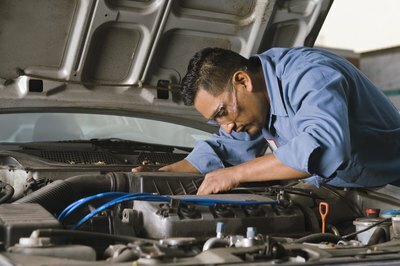 The car owner should be able to tell you about maintenance and any repairs performed on the car over the years. Ask to see the maintenance report. If the owner doesn't have one, then contact the repair shop or dealership that has performed most of the maintenance and ask for a copy of the car's records. An in-person examination could reveal problems that affect the value of the car. 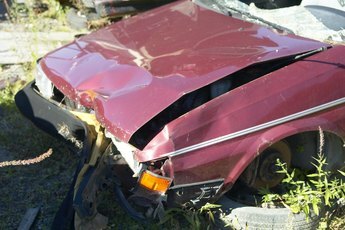 Visible faults could include chipped paint, worn tires and broken lights. For a better idea of any mechanical problems, take a licensed mechanic with you or make arrangements with the seller to take the car for an inspection. The cost of this service would depend on the mechanic, but you can expect to pay about $100 or more. When you drive the car, check for problems, such as mechanical noises, an unbalanced steering wheel and faulty brakes. You can get a better idea of how the car drives when you drive it in stop-and-go traffic, on a highway and on hilly roads. Drive the car in daylight and at night to ensure that all the components work. To find out if you are getting a good deal, compare the seller’s price to the current value of the car and the price that dealers and other private sellers are asking. Websites such as KBB.com and Edmunds.com provide current market value of a large variety of vehicles. 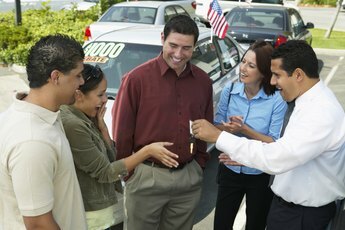 Your research and the current condition of the car will help you determine a fair offer price. The seller is more likely to consider your offer if you are prepared to pay cash. The bill of sale is a legal contract that states the details and terms of your purchase. 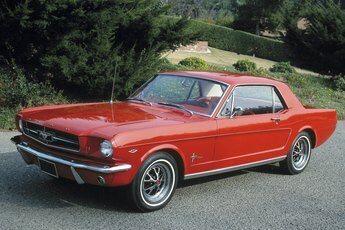 It includes a description of the car, the date and location of the sale, and the names of both parties. If it is a requirement in your state, the seller will prepare this document when you pay for the car. Any conditional agreements on the sale should be included on this contract. It can serve as evidence in court if either party fails to honor the promise. Verbal agreements are difficult to prove. The title shows the legal owner of the car. When you complete the transaction, the seller must sign the document over to you. You must show the title at the DMV to register the vehicle in your name. If the seller can’t show you a title, or if the name on the title does not match his identification, then he may be selling you a stolen car.